Majority of the glottic cancers present early because of the early symptoms like hoarseness. Radiotherapy had been the mainstay of organ preservation treatment as they had better functional outcome than open surgical procedures. With the advent of laser like the carbon dioxide (CO2) laser, with better qualities, surgical treatment has been giving equal functional and oncologic outcomes to the early glottis cancers compared to radiotherapy. It is well established that the laser surgery has good outcome in early cancers such as Tis and T1a. Hence, a good case selection can give excellent results. There are also reports of feasibility of laser surgery in moderately advanced lesions (T2 and T3). The surgical expertise, learning curve, and the resources influence the outcome. This study was done to evaluate the recurrence pattern of glottic cancers treated with laser surgery at a tertiary cancer center in India. The case selection bias has been eliminated with the intent to treat analysis, to identify the patterns of failure in difficult surgeries as well. This is a retrospective study of glottis cancer patients who underwent laser cordectomy surgery during the period August 2013–2016 at a tertiary cancer center with an aim to identify the recurrence pattern in these patients. The surgeries were done with CO2 laser with superpulse delivery in continuous mode with power set at 3–4.5 watts in Acuspot laser machine (Lumenis Inc.). The demographic details and details regarding follow-up were obtained from the patient record. The follow-up of patients was updated until the past 6 months wherever possible. The data were double entered into EpiData version 4.4.2.1 and statistical analysis was done with EpiData analysis software 2.1.0.73 (EpiData Odense, Denmark). Descriptive data are presented in numbers and percentages. The factors associated with recurrence were studied using Chi-square test at 95% confidence interval, and level of significance was kept at <5% (P < 0.05). Odds ratio was calculated wherever appropriate. There were 45 patients with glottic lesions who underwent laser surgery during the study period. Of these, two patients had benign lesions and four underwent laser-assisted biopsy alone. Hence, the results of 39 patients were assessed in this study. The median age was 66 years (41–85 years) with majority in between 40 and 60 years. All the patients were male. All except two patients had a habit of tobacco smoking (95%), of which four had tobacco chewing as well (10%) and 16 had a history of alcohol consumption also. 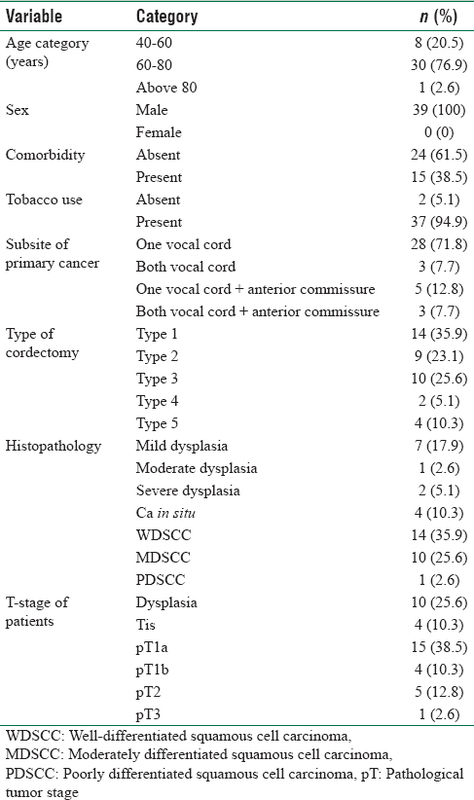 All the patients had a biopsy from the lesion with suspicion of malignancy and had clinical stage of Tis, T1, or early T2 at the time of diagnosis with the involvement of one vocal cord in majority (28, 71.8%) of patients. Anterior commissure was involved in 8 (21%) patients and was not considered contraindication for laser cordectomy [Table 1]. Type I cordectomy was done in 14, type II in 9, type III in 10, type IV in 2, and type V in 4 patients which were guided by frozen study of pathological margins. The final histopathological report showed dysplasia in 10, carcinoma in situ in 4, and squamous cell carcinoma in 25 patients. Majority of patients had pathological pT1a (15, 38.5%) whereas four had pT1b, five had pT2, and one patient had pT3 cancers. Margin was reported to be free in 31 patients and hence was kept on follow-up alone. Whereas, margin was close (within 1–2 mm) in four and involved (<1 mm) in four patients among which seven patients received radiotherapy after the surgery as adjuvant therapy. One patient did not consent for radiotherapy and was kept on close follow-up. This patient developed a recurrence later which was again treated with laser excision and has been disease-free afterward. Eight patients had recurrence in the glottis, of which six underwent second laser excision alone, one had laser excision followed by radiotherapy, and one had radiotherapy alone. Three of the second laser excision group had further recurrence, of which one had third-time laser excision, one had open partial laryngectomy, and one had laryngectomy followed by radiotherapy [Table 2]. Altogether nine patients received radiotherapy, seven due to the margin status and two after developing recurrence of which one was after laryngectomy. Open partial laryngectomy patient did not undergo radiotherapy as he had accidental death before the adjuvant therapy. The 5-year overall survival of the whole group of 39 patients including the premalignant lesions was 90% [Figure 1]. Excluding the ten premalignant patients, other patients had a survival of 88.5% and excluding the patients who got radiotherapy and laryngectomy, the remaining 20 patients had a 5-year overall survival of 89.2%. In univariate analysis, higher stage was found to be significant for recurrence with the stages pT2 and pT3 having more recurrence in comparison to early lesions (P = 0.05). This study was a retrospective study with an intent to treat analysis to identify the recurrence pattern of patients recruited for laser surgery for glottic cancers. With a good selection of patient, laser cordectomy is a feasible option of treatment for early glottic lesions (premalignant, Tis, T1a, and T1b). As the stage advances (T2 and T3), the chance of recurrence is high with single modality treatment with laser alone. Organ preservation had been the main treatment goal in laryngeal cancers which can be achieved with radiotherapy and conservation surgery. Radiotherapy established its role as an organ preservation tool after the Veteran Affairs trial. Its role was further established in randomized controlled trials. Transoral laser surgery has been used for treating glottic lesions worldwide, for the past three decades after its feasibility was proved in experimental studies. Carbon dioxide laser has been found to be useful in the larynx as it is precise in cutting, has good hemostasis, and does not need a cable to carry the laser. The voice outcomes of laser cordectomy patients in comparison to the radiotherapy were similar in early T-stages., Recent meta-analysis by Mo et al. concluded that the overall survival and larynx preservation were better in transoral laser microsurgery than radiotherapy for T1 glottic carcinoma. The indication for early glottic cancers has been expanded to moderate-sized tumors as well. Selection of patients for surgery is crucial in getting a good survival. Recurrence after laser surgery is reported to be about 16%–18% which can be treated with retreatment with laser., The recurrence rate in our study was 20.5%. The recurrence rate is higher in patients with moderately advanced glottic cancers treated with laser surgery, and hence, their role is not certain (T2 and T3). In our series, 50% of the moderately advanced glottic cancers developed recurrence whereas it was 15% in early lesions (P = 0.05). The cost-effectiveness was also found to be better in laser surgery in comparison to radiotherapy in some of the western countries. Although this was not assessed in our study, the out of pocket expenditure will be higher in patients undergoing radiotherapy due to the long duration of treatment. All the patients were discharged the next day after the laser surgery. No patients developed any complications such as airway obstruction, bleeding nor aspiration. No patient required tracheostomy or nasogastric tube insertion. Laser cordectomy can be used as a treatment for early glottic cancers as a single modality treatment with good survival and outcome. Close follow-up with endoscopy should be done, and the detection of early recurrences can be treated again with laser. Larger lesions have poorer outcome and may require adjuvant radiotherapy if detected after laser cordectomy. Frozen controlled surgery achieves a complete excision, thereby reducing the need for second surgery or adjuvant radiotherapy. Forastiere AA, Ismaila N, Lewin JS, Nathan CA, Adelstein DJ, Eisbruch A, et al. Use of larynx-preservation strategies in the treatment of laryngeal cancer: American Society of Clinical Oncology Clinical Practice Guideline Update. J Clin Oncol 2018;36:1143-69. Huang G, Luo M, Zhang J, Liu H. Laser surgery versus radiotherapy for T1a glottic carcinoma: A meta-analysis of oncologic outcomes. Acta Otolaryngol 2017;137:1204-9. Peretti G, Piazza C, Cocco D, De Benedetto L, Del Bon F, Redaelli De Zinis LO, et al. Transoral CO(2) laser treatment for T(is)-T(3) glottic cancer: The University of Brescia experience on 595 patients. Head Neck 2010;32:977-83. Cragle SP, Brandenburg JH. Laser cordectomy or radiotherapy: Cure rates, communication, and cost. Otolaryngol Head Neck Surg 1993;108:648-54. Jako GJ. Laser surgery of the vocal cords. An experimental study with carbon dioxide lasers on dogs. Laryngoscope 1972;82:2204-16. Ossoff RH, Coleman JA, Courey MS, Duncavage JA, Werkhaven JA, Reinisch L, et al. Clinical applications of lasers in otolaryngology – Head and neck surgery. Lasers Surg Med 1994;15:217-48. Kinshuck AJ, Shenoy A, Jones TM. Voice outcomes for early laryngeal cancer. Curr Opin Otolaryngol Head Neck Surg 2017;25:211-6. Du G, Liu C, Yu W, Li J, Li W, Wang C, et al. Voice outcomes after laser surgery vs. radiotherapy of early glottic carcinoma: A meta-analysis. Int J Clin Exp Med 2015;8:17206-13. Mo HL, Li J, Yang X, Zhang F, Xiong JW, Yang ZL, et al. Transoral laser microsurgery versus radiotherapy for T1 glottic carcinoma: A systematic review and meta-analysis. Lasers Med Sci 2017;32:461-7. Kelkar DS, Gandhi SS, Oka GA. Surgical treatment of glottic cancer: Retrospective analysis of 192 cases in a multidisciplinary tertiary care centre in Pune, India. J Laryngol Otol 2015;129:261-6. Ambrosch P. The role of laser microsurgery in the treatment of laryngeal cancer. Curr Opin Otolaryngol Head Neck Surg 2007;15:82-8. Prettyjohns M, Winter S, Kerawala C, Paleri V, the NICE cancer of the upper aerodigestive tract guideline committee. Transoral laser microsurgery versus radiation therapy in the management of T1 and T2 laryngeal glottic carcinoma: Which modality is cost-effective within the UK? Clin Otolaryngol 2017;42:404-15. Rosier JF, Grégoire V, Counoy H, Octave-Prignot M, Rombaut P, Scalliet P, et al. Comparison of external radiotherapy, laser microsurgery and partial laryngectomy for the treatment of T1N0M0 glottic carcinomas: A retrospective evaluation. Radiother Oncol 1998;48:175-83.